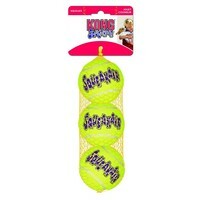 Air Kong Squeaker Tennis Balls come in a pack of 3. This durable, high quality Squeaker tennis ball is covered in a non abrasive tennis ball material that will not wear down dog's teeth. All squeaker units are hidden and covered by the tennis ball fabric creating a clean, finished look. 2.5" Diameter: tube of 3 balls. I have had 4 packs of these and my golden retriever loves them. I only take them out when I play with him and so they remain high in his reward criteria. He responds 95% of the time in the park and generally does not stray. The squeak falls out after a week or two but the ball lasts quite some time in fact we generally lose them before they break. Very squidgy and dogs can squeeze them alot longer than some of the tennis balls we have had in the past. My Border Collie loves these tennis balls and so do I - they're not rock hard like other dog tennis balls so I don't worry about him hurting his jaw, the give they have to allow for the squeak is excellent as they also don't seem to "pop" as often as normal tennis balls when caught. not all of them are perfect however, you get the odd weak one and they're not indestructible, but I'll never go back to buying him any other brand of ball after trying these! My dog, Grumpy, loves his 3 bright yellow squeaky balls. He has had his for some months now and only one of the squeakers has stopped working. He takes them everywhere with him. Great product. My dog is a big fan of these. The squeaker sometimes doesn't last long but they are otherwise pretty sturdy for a tennis ball, and stand up to a fair bit more than most.